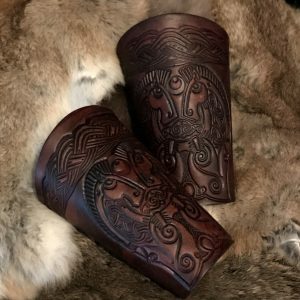 The Black Raven LARP Leather Vambraces are a simple but elegant?design of armguard, offered by Black Raven Armoury , they have been professionally dyed and built for you by ourselves. Created & designed by Alex Agricola, the whole set is made of premium grade top grain 3.2-3.5 mm Veg Tanned leather. 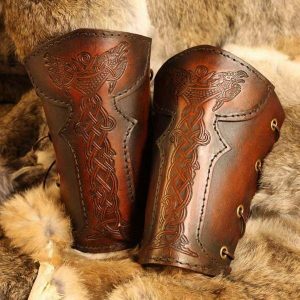 The Black Raven LARP Leather Vambraces are our signature design. They deliver a simple but elegant arm-guard to complete one’s set of armour or to enhance a more formal outfit. 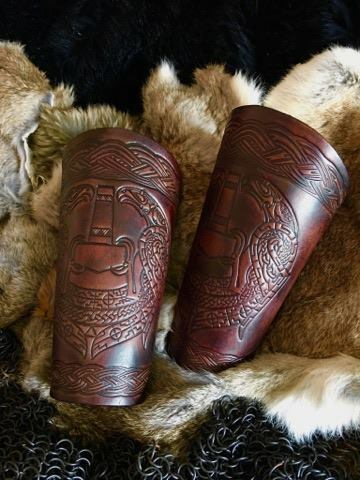 Alex Agricola, black Raven Armoury?s own Craftsman based these Vambraces on an ancient design he discovered while researching medieval manuscripts and they sport a unique Celtic Design. 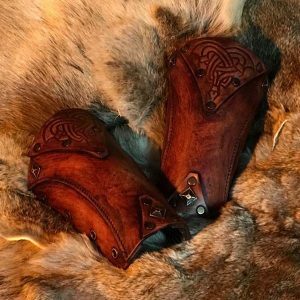 Made of premium grade top grain 3.2-3.5 mm Veg Tanned leather and available in regular and large sizes, these vambraces are designed to turn sword and heads alike. For embellishment, the larger size has an extra embossing panel next to the wrist. ?I saw him once at Castell Gwynn… he looked like a rogue from a distance until I saw his gauntlets… no man in Covington Glen could afford Vambraces like that without a noble name…? All armours come ready built and finished in the colour of your choice, apart from the undyed natural version which is left for you to stain and finish, in your own choice of colour.